Habit: Annual 1--5 dm, from taproot. Stem: 1--6, branched from base or +- throughout, glabrous or sparsely hairy. Leaf: +- evenly distributed or distally reduced, proximal 2--8 cm, 0.5--3 cm wide, lance-linear to lanceolate, tapered to winged petiole or sessile, +- entire to dentate or pinnately lobed, +- fleshy, mid and distal sessile, clasping. Inflorescence: heads radiate; (1)3--15+ in open clusters; involucre bell-shaped, phyllaries generally 21 (fewer), 5--8 mm, tips black; outer phyllaries inconspicuous or 0. Ray Flower: 10--15; ray 8--12 mm. Disk Flower: 45--55+. Fruit: 2--2.5 mm, short-stiff hairy. Chromosomes: 2n=40. 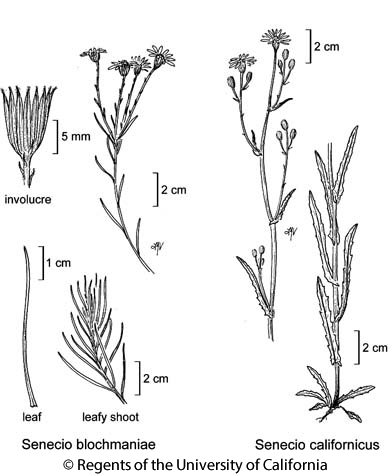 Citation for this treatment: Debra K. Trock 2012, Senecio californicus, in Jepson Flora Project (eds.) Jepson eFlora, http://ucjeps.berkeley.edu/eflora/eflora_display.php?tid=4691, accessed on April 20, 2019.
s SN, Teh, CW, SW, DSon; Markers link to CCH specimen records. Yellow markers indicate records that may provide evidence for eFlora range revision or may have georeferencing or identification issues. Purple markers indicate specimens collected from a garden, greenhouse, or other non-wild location.